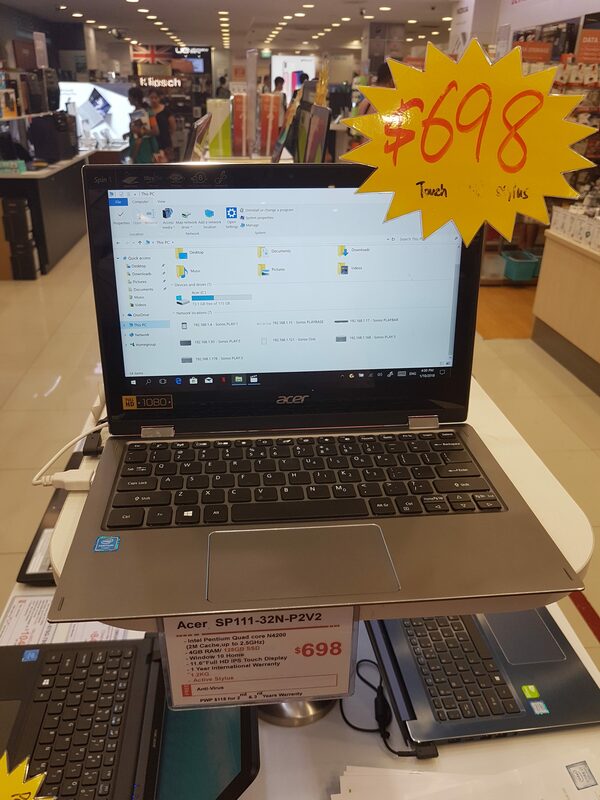 Laptops sold in Singapore can generally be classified into two categories: bargain-basement offerings with specifications considered mediocre even eight years ago, or premium offerings that offer the latest in display, storage and processor technologies. The Acer Swift 1 straddles the rare middle ground, offering a Full HD screen (as compared to the dated 1366×768 offerings seen in virtually all budget laptops), 4GB RAM and up to a 128GB SSD, all for just S$500 (if you know where to look; more on that later). The catch? You're saddled with an Intel Celeron N3350 processor, an Atom-class processor that is far from the fastest thing around. The Swift 1 first caught my eye in a departmental store in central Bangkok, where I was vacationing last December. Costing the equivalent of S$500 (or slightly less) in Thai baht, I thought it was a pretty good deal for a laptop with a Full HD screen. When I returned to Singapore, I set out on a mission to find it. Of the brick-and-mortar stores, Challenger sold a similar model, the Spin 1, for $698. The Spin 1 features a slightly faster Pentium processor, a smaller 11.6" (but still Full HD) convertible screen and an active stylus supporting Windows Ink. The Acer Spin 1, a sibling of the Swift 1. At $698, the value proposition wasn't that apparent (unless you needed ink support), for you could get laptops with far better specifications for less than $100 more. Hachi.tech, which sells the 128GB version for $583 as well. The model is also available only at Challenger's NEX outlet. Harvey Norman's online store shows the laptop (128GB version) selling for $583. It is also available in limited quantities in certain physical stores, such as Djitsun Mall. By signing up for their e-newsletter, you get an additional $10 off. Audio House lists the 128GB version for sale at $583, though it requires a pre-order. At the time of writing, Audio House is currently offering new members a e-voucher of up to $100, potentially bringing the price down to just $483, a worthwhile steal. The FairPrice Xtra outlet at AMK Hub sells the 128GB version for $599. Meanwhile, for a limited time only, it also sells the Spin 1 for $648, which may be worth considering. As mentioned earlier, the value proposition of the Swift 1 lies in its display and storage specifications. A Full HD screen enables you to display more content on your screen, allowing you to be more productive in applications such as Microsoft Office, Adobe Photoshop/ Lightroom and Adobe Premiere. 4GB of RAM may not be plentiful these days, but should still suffice for day-to-day tasks. The 128GB SSD, while not blazing fast according to TrustedReviews, will still perform better than similar budget entries with eMMC drives or traditional spinning hard disks. Battery life is rated at ten hours, which is enough to get you through a typical work day. It comes equipped with a SD card reader, fingerprint scanner, USB Type-C port, one USB 3.0 port, two USB 2.0 ports, a headphone/mic jack and a full-sized HDMI port. Unfortunately, it doesn't seem as though you can charge via USB Type-C. The Swift 1 is also equipped with a 2×2 Wireless-AC adaptor, enabling speeds of up to 867Mbps over the 2.4GHz and 5GHz bands. 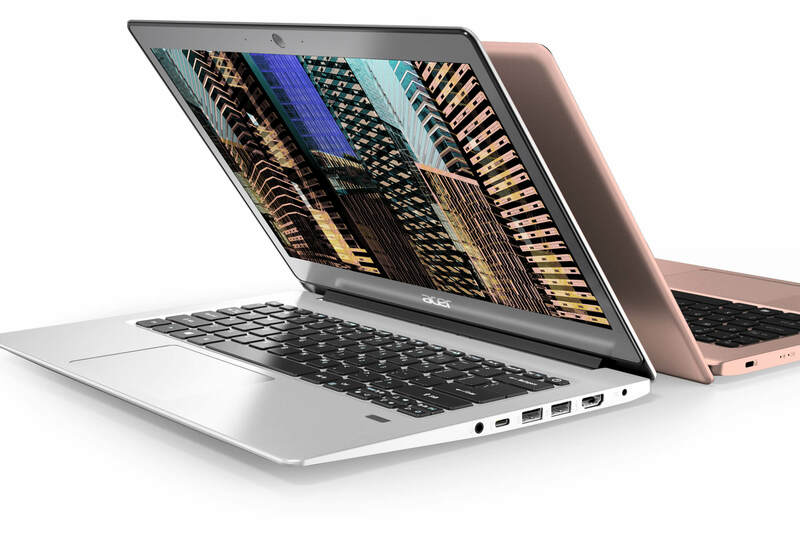 Material-wise, the Swift 1 has an all-metal design that is reminiscent of the MacBook Air. It even has, for better or for worse, the Power button placed on the top right corner of the keyboard, right next to the Delete button. On the bright side, the Swift 1 has Page Up and Page Down buttons accessible without the need for a Fn key press, which is a nicety that many manufacturers, such as HP, tend to neglect these days. As a trade-off for the price, you are saddled with an Atom-class (i.e. slow) processor running at a clock speed of just 1.1GHz, thus making it less suitable as a primary computer. Where the Swift 1 excels, though, is in being a laptop you bring about on the go, such as to school, or in your carry-on luggage on travels. The full-sized HDMI port and plethora of USB ports available makes it easy for you to conduct presentations without needing to bring along spare dongles. The SD card slot allows you to transfer photos and videos from your camera for immediate processing, which is only made easier with its large 13" Full HD screen. Weighing a svelte 1.3kg, it's also not too much of a burden to carry around with you. Charging over USB Type-C would've been preferred, but if the battery life is as claimed, it is not a dealbreaker to most. All in all, the Swift 1 seems to be a good buy, especially if you can pair it with discount codes and vouchers to bring the price to around $500. If you need help in getting the best prices available, feel free to leave a comment below and I'll be more than glad to assist you for free.